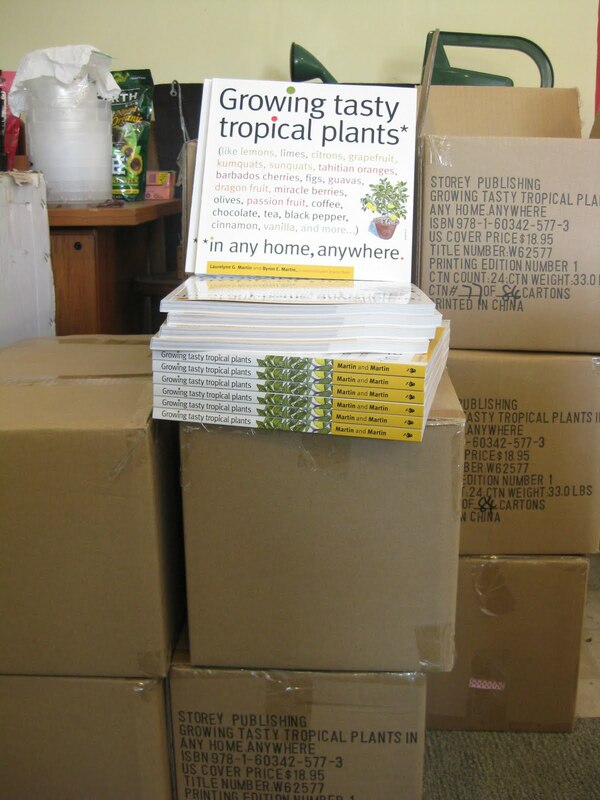 Our fruit book Growing Tasty Tropical Plants *In Any Home, Anywhere aired on Martha Stewart TV (Hallmark Channel) on Friday, November 5th. We traveled to New York City on November 3rd to tape the show and the fruit plants that we chose for the show are pictured below. First, our Black Olive plant (Olea europaea 'Arbequina'). The plant pictured is two years old and is a 5 foot tree with unripe olives (green) and ripe olives (black). Growing an olive tree is easy as long as you have nighttime temperatures in the winter down to 40˚F. It is the chill down that brings on flowering and ultimately the fruit. Next, our five year old Dragon Fruit (Hylocerus undatus) plant that is in fruit. The pink fruit when sliced open has a delicious custardy center that can be scooped out and eaten. If you just want to order the fruit and not the plant go to From the Farm, a tropical fruit grower in Florida does a really nice job of growing and shipping the fruit. Our amazing Dwarf Starfruit (Averrhoa carambola 'Dwarf Maher') is an abundant producer of sweet juicy fruit. When cut in half a five-pointed star is created. Fruit starts forming at only 2 feet in height. 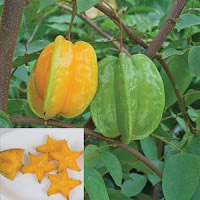 Give plenty of sun, and water when dry and you will have your own starfruit in no time. The Flower of chocolate. The ripe Chocolate pod. 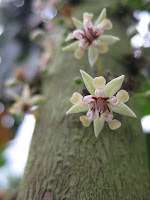 Chocolate is a must and our Chocolate Plant (Theobroma cacao) was featured on the show as well. Of course, the previous blog just talked about all the in's and out's of growing chocolate. On Martha TV, we showed how to make chocolate nibs from the cocooned chocolate fruit. Basically, the chocolate beans need to ferment for a week and then roast and dry them. Then, you can eat the beans or use a mortar and pestle to crush them into chocolate nibs. Delicious. From the Farm also offers the roasted chocolate beans for the daring and curious fruit connoisseur. Our Passion Fruit (Passiflora edulis 'McCann') traveled to NYC with its golden yellow fruit that is as sweet as they come. 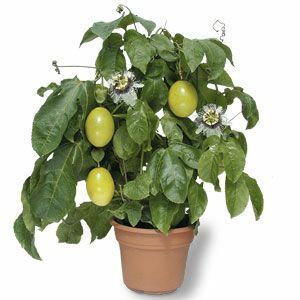 Passiflora is grown for its amazing flowers and delicious fruit. It is vining so needs support but is relatively easy care. Passion Flowers in their native habitat grow in poor soil and at time drought like conditions. Finally the last plant is a pineapple. 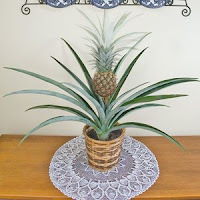 We showed how to cut off the top of a pineapple and put it in a pot for easy propagation. 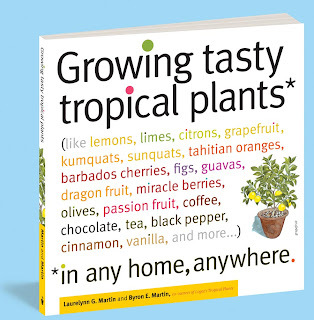 All of these fruiting plants and many more can be found in our new book Growing Tasty Tropical Plants, which is available from Logee's or your local bookstore. Our shipment of books arrived and we learned that it was voted in the top 10 for the Best Book in Craft and Garden for the 2010 year!